The 2012 Current Population Survey November supplement has now been released which enables one to examine voting patterns by different racial and ethnic groups and different age groups. 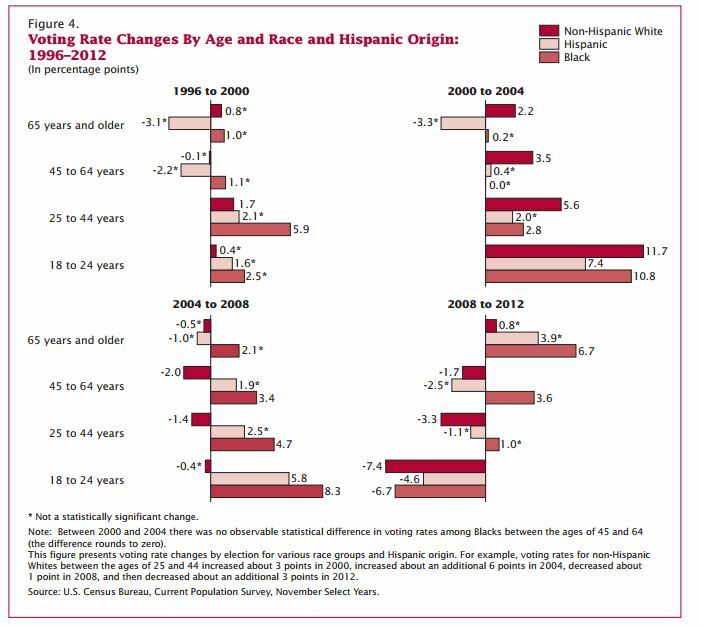 If one breaks it down by racial origin, among all racial groups, voting rates for 18-24 year olds were down from 2008 to 2012, declining by 7.4% for non-Hispanic whites, 4.6% for Hispanics and 6.7% for blacks. This reverses patterns seen in the 2004 and 2008 presidential elections where the biggest voting increases came from 18-24 year olds. For example, from 2004 to 2008, Hispanic 18-24 year olds and black 18-24 year olds increased their voting rates by 5.8% and 8.3% respectively. CIRCLE noted earlier that the National Exit Poll from November 2012 estimated that these young people represented 19% of the voters and that President Obama captured 60% of their votes compared to 37% for Romney. CIRCLE pointed out that if young people had stayed home or if Romney had captured half of the youth vote in Ohio, Florida, Pennsylvania and Virginia, he would have won the presidency. The youth vote was also decisive in Obama’s 2008 victory. Among adults, non-white voter turnout increased in 2012: more of that story here. Blacks voted in 2012 at higher rates than whites for the first time since 1996. Bad news for Republicans is that, according to the CPS, the share of white votes declined in every one of the battleground states in 2012 (other than Iowa). As Nate Silver has noted (on 538 Blog), the share of non-white votes in battleground states makes a difference in changing the election results, unless one assumes that Republicans are suddenly going to start doing a better job of appealing to non-white groups. 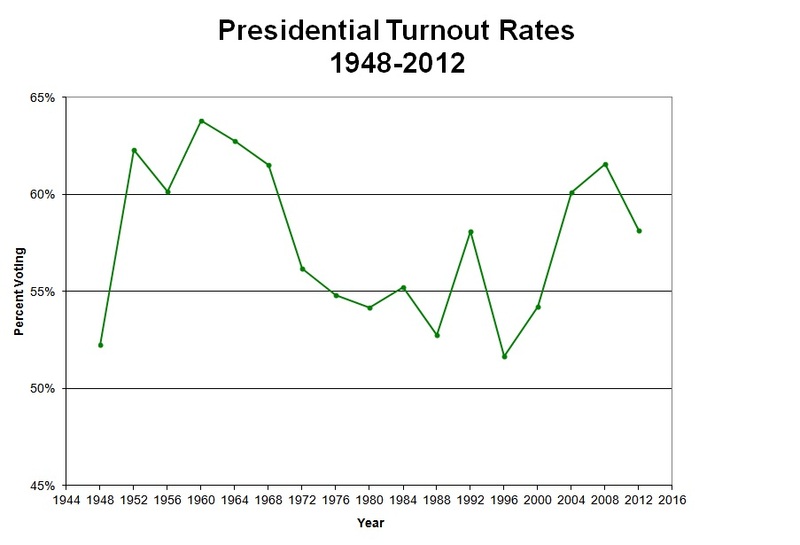 Census reports that the overall turnout (youth and adults) was down somewhat in 2012 as well: from 63.8% in 2008 to 61.8% in 2012. Michael McDonald, using different measures that rely not on self-reports but on ballots cast by state finds a similar pattern: 61.6% of those eligible to vote voted in 2008 and that declined to 58.2% in 2012 (a decrease of 3.4 percentage points or a decline of 5.6%). There was some speculation in November that Hurricane Sandy was to blame. While turnout declined substantially in Eastern states devastated by Hurricane Sandy, turnout also declined in most states nation-wide, making it dubious that one can lay the blame for lower turnout on Sandy. For more on racial patterns in 2012 turnout and age-based patterns see the Census report on this topic. Edgar Cahn, founder of the Time Dollars program, has interesting thoughts on the economy in a TEDxAshokaU talk. Traditional economics are focused only on “part of the map”; they ignore the 1/3 that economists think are unimportant: “the one that you go home to every night, it’s called home, family, community;…it probably doesn’t do anything important from the point of GDP. It just raises children, makes neighborhoods safe and vibrant, raises strong families, takes care of the elderly, gets involved in things like elections, tries to make democracy work, tries to make officials accountable, fights for social justice, tries to keep the planet sustainable, but nothing of economic importance you understand …” (laughter) “There is a core economy” (family, neighborhood, community, civil society, networks and informal support systems) that is analogous to a computer’s operating system; many powerful specific programs (like monetary system) don’t work if the core economy goes down. He notes that new “social enterprise system” is about reviving this social economy. Traditional entrepreneurship can’t effectively unilaterally deliver health care, education, welfare, community justice, or democracy. Need to enlist people as “co-producers”. Need economy that runs both on money and on compassion, since traditional economy values things only that are scarce and love, compassion, grieving, decision-making in small groups, standing up for what is right are universal and hence defined away by the traditional economy as worthless. We need to revalue compassion, caring, civic engagement. Alvin Toffler explained this point by asking a corporate CEO how effective their best employees would be if they were not toilet-trained. A critical component is reciprocity and “pay it forward“, which is what lead Cahn to “time dollars” (the currency of time) or his “time dollar youth court“. We need to look through the lens of possibility: returning prison convicts in DC could guarantee safe passage at any street corner through gang territory. Gen X-ers increasingly civicly engaged? The Longitudinal Study of American Youth at University of Michigan has issued a new report “The Generation X Report: Active, Balanced, and Happy: These young Americans are not bowling alone“, whose conclusions are evident from its title. Data they use: the LSAY began in 1987 with a national sample of 7th and 10th grade students in 50 U.S. public school systems; these 5,900 students were tracked for 6 years. Then 95% of them were relocated in 2007 and interviewing has resumed annually for the last 4 years. Survey participants are now 36 and 39 years old. “One in three Generation X young adults is an active member of a church or religious organization and almost all of these young adults report attending one or more church or religious activities or events each week. Thirty percent of Generation X young adults indicated that they are active members of a professional, business, or union organization, which provides additional opportunities for social interactions. Seventeen percent of all LSAY young adults are active members of a parent-teacher organization and 24% of the parents of minor children indicated that they are active in a school-based parent-teacher organization. Seventeen percent of Generation X young adult say that they are active in one or more community service groups and 29% report that they do some hours of volunteer work in their community each month. Four percent were active members of a book group and 3% indicated that they were active members of an environmental group…. The young adults in Generation X maintain an active social network outside formal groups and organizations. Ninety-five percent of LSAY young adults report that they talk to friends or family by telephone at least once each week and 29% say that they talk to friends or family on the phone once a day. Ten percent indicate that they have at least two telephone conversations with friends or family each day. Slightly more than 80% of young adults report visiting a friend or relative each week and 29% say that they make three of more visits to friends or family each week. Clearly, these young adults are engaged in continuous communication and interaction with other members of their family and their social network. One of Putnam’s indicators of social capital was the frequency of inviting friends into one’s home for dinner, and he found this kind of social interaction to be diminishing. Generation X young adults in the LSAY report a substantial level of social interaction over food. Two-thirds reported that they entertain friends for dinner in their home or engage in group cooking activities with other adults at least once each month and 35% say that they entertain or participate in group cooking two or more times each month. We have written about how the generation below Gen-X (those in their late 20s) are more engaged now than a generation ago (See Sander-Putnam “Still Bowling Alone“). As the scholars involved in LSAY surely know, there is no way just by looking at the levels of engagement of a group at a specific period of time to sort out how much of this is age (activities that people do more at certain ages than others), cohort (what is distinctive about, say GenXers), and period (what is distinctive about a specific period in history, say the Great Recession). To sort out these age-period-cohort effects one needs to either compare people at the same age over time (say interviewing high school seniors every year for 30 years and seeing how high-school seniors are different now than high-school seniors 30 years ago) or having cross-sections of the US at multiple points in time so you can have multiple points for different birth cohorts at different ages. Without this, it is somewhat like a Rohrshach pattern to observe GenXers today and opine about whether they are or not engaged. Many of the activities they focus on (home entertaining or church attendance or PTA involvement) peak in the middle years as parents are trying to introduce their kids to religion or getting involved through schools. That said, I hope their conclusion is correct, much as I’d need to see different evidence to believe it. Read the LSAY report here. 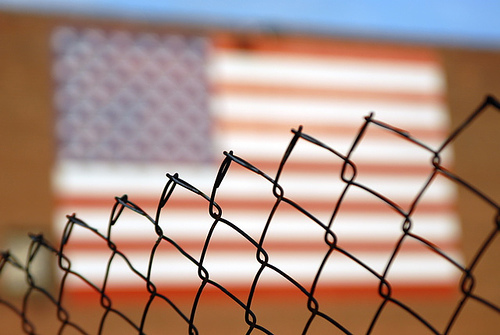 Does civic engagement help immunize a place against recession? Their research, based on the Current Population Survey (CPS), specifically compared levels of “social capital” in 2006 (using measures like volunteering, attendance at public meetings, helping neighbors, voting and registering to vote) with the rise in unemployment from 2006-2010 at the state level. In the attached representative chart the states are color-coded by the growth in unemployment from 2006-2010. States experiencing the highest growth in unemployment are orange and red for highest growth. The horizontal axis measures the % of residents who worked with their neighbors in 2006. One can see that states experiencing the biggest growth in unemployment were the least “civic” states. They admitted that this correlation doesn’t prove that social capital CAUSED the lower run-up in unemployment but it is a strong circumstantial case. Seeing an early draft of these findings, we suspected that it was the strong economic growth rate in some states that drove a lot of in-migration which in turn lowered social capital (since uprooting is as bad for social capital as it is for plants). If that were the story, and the current Great Recession was worst in the places that experienced the biggest economic booms pre-recession, then these pre-recession booms could be causing both lower social capital (working through mobility) and the higher run-up in unemployment when the state economy crashed. But Levine and Dietz controlled for factors like the housing bubble pre-recession, residential mobility, and other predictors of state unemployment and their findings remained. A colleague of ours, Chaeyoon Lim, at the University of Wisconsin has been undertaking related interesting unpublished research on this topic and so far finding consistent and robust findings. Based on the Dietz/Levine findings and Lim’s unpublished findings, our hunch is that this finding might very well be real. people in more engaged communities may feel greater community attachment which leads them to invest more locally. The brief is likely to catch the ire of traditional economists who believe that almost everything important flows from economic variables, not the reverse. His second concern is based on research that has identified an increasing class division. Despite greater integration along religious and racial lines, there is an opposite trend when it comes to class, mainly, he believes, because of the widening gap in incomes. Americans are less likely today to marry outside their class. Children from lower classes are less likely to spend time with their peers or take part in community activities and have less confidence, while the trend for middle-class children is the opposite. [For more on this youth growing class gap, see “Still Bowling Alone?“] “Kids coming from upper middle-class backgrounds are living in a different world now from kids coming from working-class or less well-off backgrounds,” Putnam says, adding the sense of collective responsibility for children in a community has disappeared. Putnam has had a receptive hearing from both George W. Bush and Barack Obama on this issue because it goes to core American values. He is arguing for a focus on early childhood education and child welfare. That would be easier in an era that was less polarised politically, where consensus is elusive even on issues on which there is underlying agreement.